Kingsman IDV33 Gas Fireplace Insert Package Deal!! KINGSMAN IDV33 PACKAGE DEAL!! YOU CAN`T BEAT THIS DEAL. 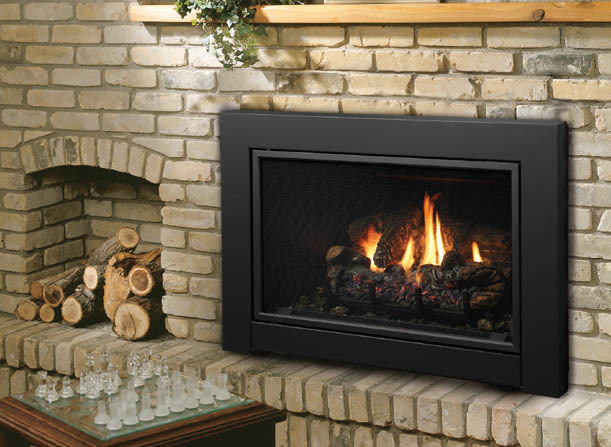 INCLUDED IS THE iDV33NE2 GAS FIREPLACE INSERT- THIS THE HEATER RATED TOP OF THE LINE MODEL W/ BUILT IN FAN, ELECTRONIC IGNITION & MULTI FUNCTION REMOTE CONTROL! Convert your wood burning fireplace to gas, for a new standard of warmth, style, safety and convenience with the Kingsman IDV33 Direct Vent Fireplace Insert! With 75% efficiency it is sure to warm up your home and family during the colder winter months. This fireplace insert will work great in a living room to replace an existing wood burning fireplace and is approved to be used in a mobile home, bedroom or bed sitting room. This insert can easily be designed to match your home decor - choose from louver kits or clean view kits and an optional surround and doors to create your own distinctive appearance. * All gas fireplaces manufactured as of January 1, 2015 will include a Safety Screen Barrier. Select from a millivolt or intermittent pilot ignition system. The millivolt valve system does not use electricity, but has a standing pilot which allows operation during a power failure with hi-low heat and flame adjustment. The intermittent pilot ignition is electronic and uses an electrode to ignite the pilot. The IPI system ensures the pilot flame extends over the burner for immediate ignition and it conserves energy when the appliance is not in operation. Direct vent fireplace inserts use a dual vent system, generally two 3" flex gas lines, one pipe is for exhaust, while the other pipe brings in outside air for combustion. The design of this insert allows for a completely sealed system that does not compromise inside air quality of your home.